Ramzi Yousef is serving a life plus 240-year sentence in a the nation's highest-security prison in Florence, Colorado. NEW YORK (CNN) -- A federal appeals court has affirmed the convictions and sentence of Ramzi Yousef, who was found guilty of masterminding the first terrorist attack on the World Trade Center. A three-judge panel of the 2nd U.S. Circuit Court of Appeals handed down its 186-page decision Friday, saying, "We have considered all of the defendant's remaining arguments and conclude that they are without merit." The decision upheld Yousef's convictions -- in two jury trials -- for the 1993 trade center truck bombing that killed six people, injured more than 1,000, and caused half a billion dollars in property damage, and for his foiled plot to blow up nearly a dozen airliners over Southeast Asia. Yousef is serving a life plus 240-year sentence in a the nation's highest-security prison in Florence, Colorado. Federal prosecutors did not have the death penalty available to them at the time of his two trials, in 1996 and 1997. U.S. District Judge Kevin Duffy imposed the symbolic 240-years by calculating the collective number of years of life the trade center attack victims lost, based on normal life expectancy. The appeals court found that Duffy's sentence did not violate the "cruel and unusual punishment" clause of the Constitution. "Judge Duffy carefully, impartially, and commendably conducted the two lengthy and extraordinarily complex trials," the appeals panel ruled. The court also found the federal Southern District of New York was the proper venue for Yousef's trials and that the evidence was properly admitted, including Yousef's post-arrest statements. "The fairness of the proceedings over which he presided is beyond doubt," the decision said. Yousef, 35, a man of many aliases whose background is still shrouded in mystery, arrived in the United States on an Iraqi passport in 1992 and assembled a team of co-conspirators. Four of those men -- Ahmad Ajaj, Nidal Ayad, Mohamed Salemeh, Moahmoud Abouhalima -- were convicted in an earlier trial; one -- Eyad Ismoil -- was convicted with him; and one -- Abdul Rahman Yasin -- remains an indicted fugitive and is believed to be in Iraq. According to trial records, Yousef and his accomplices based themselves across the Hudson River in a Jersey City, New Jersey, apartment, where they made their 1,200-pound nitroglycerin-based bomb. His fingerprints were found in the apartment, in a nearby storage shed, and on a bomb-making manual. On February 26, 1993, Yousef and Ismoil drove a rented Ryder truck into the underground parking garage of the trade center's north tower, detonating the truck bomb at 12:18 p.m., when there were an estimated 50,000 people in the Twin Towers. The date of the attack was the second anniversary of the liberation of Kuwait in the first U.S.-led war with Iraq. 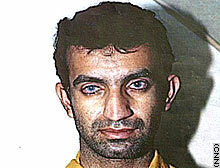 Yousef fled and eventually landed on the FBI's 10 Most Wanted List. He settled in the Philippines, where he planned to blow up 11 U.S.-bound airliners in a single day -- a plot he called "Bojinka," a Serb-Croat word for explosion. Investigators uncovered the plot by searching a laptop computer Yousef abandoned when a fire broke out in his Manila apartment. The fire was caused by mixing explosive chemicals. One of Yousef's conspirators captured that night, Abdul Hakim Murad, who went to flight school in the United States, later told interrogators that he and Yousef had considered a suicide aircraft attack on the CIA headquarters in Langley, Virginia, court documents say. Another conspirator, Khalid Sheikh Mohammed, believed to be Yousef's uncle, later emerged as a top planner for al Qaeda, the Islamist terrorist group that engineered the September 11 terrorist attacks on the United States. Mohammed, like Yousef, has roots in the Baluchistan region of Pakistan and was raised in Kuwait. He is being detained at an undisclosed location after his capture two months ago. Two years after the first trade center attack, in February 1995, Yousef was tracked down in Islamabad, Pakistan. An informant in Pakistan, seeking the U.S. government's $2 million reward, turned Yousef in. Yousef told his captors that his plan had been to cause one tower to topple into the other and that he might have succeeded if he'd had more funding. On September 11, 1998, Yousef sued the Bureau of Prisons over what he called "Draconian" restrictions imposed on him in Colorado. © 2005 Cable News Network LP, LLLP. All external sites will open in a new browser. CNN.com does not endorse external sites.